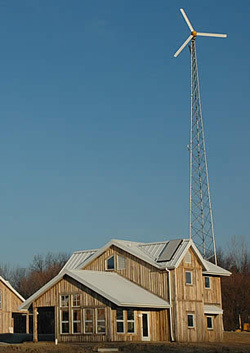 (Goshen, Indiana) - When Luke Gascho, Goshen College’s Merry Lea Building Executive Director, interviewed contractors and architects for a new collegiate facility, he looked for firms with an awareness of sustainable building and an interest in trying to achieve it. He also kept the search regional rather than pursuing groups already nationally known for sustainable building. Several nationally known consultants with unique areas of expertise also contributed to the design process, including KMC Controls for the internal environment. The facility is designed to serve undergraduate students studying natural history, environmental education and agroecology. Rieth Village was conceived and designed to meet the highest standards of the U.S. Green Building Council’s LEED (Leadership in Energy and Environmental Design) rating system. LEED buildings are required to meet rigorous standards in areas such as energy efficiency, water management, use of recycled materials and indoor air quality. 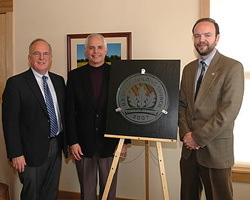 At present, only a handful of Indiana buildings have attained LEED certification. “We are not just building a shelter: we are creating a teaching tool and a model for others who want to make environmentally sound choices." KMC Control systems add to the sustainability of these cottages. They will enable generations of students to study, live with and learn how efficient building automation systems can be used to help create “green” buildings. 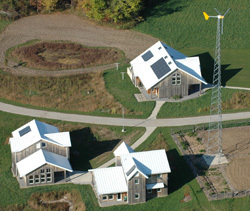 Click here to see more about the Environmental Learning Center of Goshen College.